Background: Originally described as a single, more widespread species (i.e., “spotted frog”), two species of spotted frogs have been recognized since 1997: the Oregon Spotted Frog (Rana pretiosa) and the Columbia Spotted Frog (Rana luteiventris). Older field guides treat them as one species (but they are discussed separately in Amphibians of the Pacific Northwest, Jones et al. 2005). In Washington, the Columbia Spotted Frog occurs east of the Cascades and appears to have stable populations. The Oregon Spotted Frog is a Washington State Endangered Species and in August 2014 was listed as a threatened species under the Federal Endangered Species Act. Oregon Spotted Frogs were first detected in Whatcom County in 2011. Populations of this species are known to occur at only four sites in British Columbia, Canada; six sub-basin/watersheds in Washington (mostly in Thurston, Klickitat, and Whatcom/Skagit counties); and eight sub-basins in Oregon. The Oregon Spotted Frog may have been extirpated in northern California, where it formerly occurred in the Klamath River drainage, in the Willamette River Valley in Oregon, and at most sites in the Puget Trough in Washington. Adult and Juvenile Description: Adults have upturned eyes that are bright yellow green (chartreuse) or gold. The hind legs are short and muscular. Webbing on the hind feet extends along both sides of the toes almost to the tips. Most individuals have black spotting, although the spots may be difficult to see on some dark individuals. The spots have indistinct or sharply scalloped edges with a light center associated with a small bump (gland). The skin on the belly and underside of hind legs is opaque (i.e., the bones and muscles under the skin are not discernible), with dark mottling. In some populations (although not in Whatcom County), the undersides are also washed with reddish to orange pigments that appear painted on the surface. The eye mask is dull and poorly defined. Dorsolateral folds (thick folds of skin extending along the sides of the back from behind each eye) are present, although not always prominent. The call is a soft, low-pitched, rapid, hollow knocking. Adult males are smaller than females (the largest females being up to 4 inches body length, and males up to 3 inches). Juveniles are similar in appearance. Features that differentiate Oregon Spotted Frog from Northern Red-legged Frog include the upturned, brightly colored eyes (compared to Northern Red-legged Frog’s outward facing, brown or gold eyes), a crouched posture (compared to more upright posture of Northern Red-legged Frog), highly aquatic habit (compared to Northern Red-legged Frog, which is much more terrestrial), and a tendency to remain still when approached (compared to rapid, long leaps of the Northern Red-legged Frog). Viewed from above, the eyes of an Oregon Spotted Frog do not (or only slightly) protrude beyond the outline of the body, but noticeably protrude beyond the body line of a Northern Red-legged Frog. Larval Description: Hatchlings typically stay on top of the mass in dense aggregations for several days before swimming off. Hatchlings have a relatively long tail shaped like a spear that is longer than tails of hatchling Northern Red-legged Frogs. As tadpoles grow and develop, the relative length of the tail does not reliably differentiate larvae of the two species. Instead, differences in pigment patterns on the belly may provide the best means of differentiating the species where they occur together. Oregon Spotted Frog tadpoles have a light gold, aluminum-colored to creamy white belly with fine-grained markings or immaculate in later stages. The underbellies of Northern Red-legged Frog tadpoles of all stages are marked with irregularly shaped, metallic-pigmented blotches on a dark background; the density of blotches increases during development and the blotches may coalesce. However, even at high density, a reticulated pattern or network of dark lines is evident and blotches usually still occur at the margin. Egg Description: Each egg mass, which may contain 400-700 eggs, is soft and orange- to grapefruit-sized, and has the appearance of a dense cluster of grapes. Individual, freshly laid eggs are black above and white below. Each egg has a narrow envelope of jelly, so eggs appear tightly packed in the mass. Egg masses are usually laid on top of or adjacent to each other with often more than 20 masses in a cluster or aggregation. The masses are not attached to a brace (vegetation) and are usually in shallow water (i.e., 2-12 inches deep), often with the surface of the masses not fully immersed. Egg mass clusters are usually laid on top of the previous year’s submerged, flattened vegetation. At sites with changing water levels, the egg masses may later be exposed or float near the surface. Habitat: The Oregon Spotted Frog occupies sites with permanent water. The frogs do not move far from aquatic areas, but may use different habitats at different times of the year. Breeding sites are dominated by herbaceous vegetation and located in very shallow water in open fields, marshes, or edges of ponds or mountain lakes. The use of breeding sites in herbaceous wetlands within a forested (alder-dominated) wetland occurs very rarely. Breeding locations may hold water only seasonally. 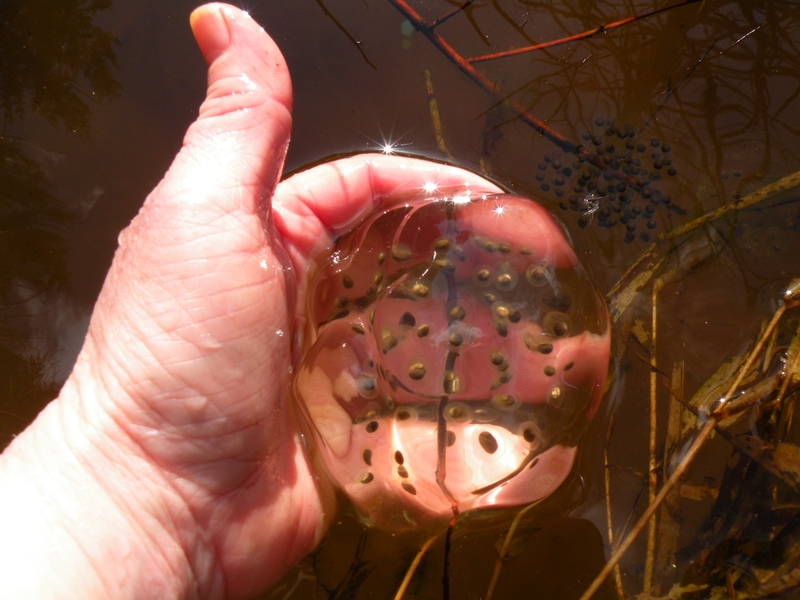 Oregon Spotted Frog tadpoles require about 3 to 4 months to reach metamorphosis. After metamorphosis, the transformed frogs remain associated with aquatic habitats. Adults may move to deeper water habitats in summer and over-winter in springs or streams that do not freeze. Locations in Whatcom County: This species has been found at sites in the watersheds of the South Fork of the Nooksack River from Acme north, the Samish River south of Acme (extending into Skagit County), and one location in Sumas River headwaters. Additional sites may await discovery. Hallock, L. 2013. 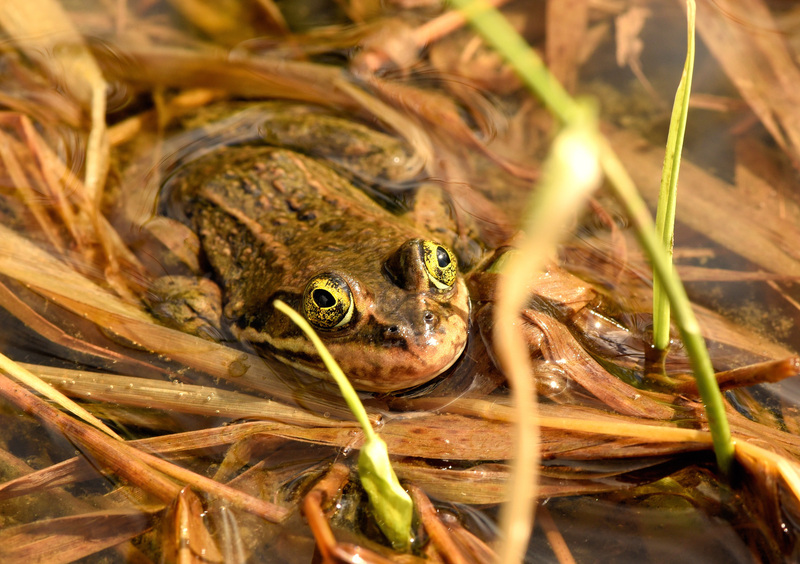 Draft State of Washington State Oregon Spotted Frog Recovery Plan.